SSR 146977 is a new potent nonpeptide tachykinin NK3 receptor antagonist. 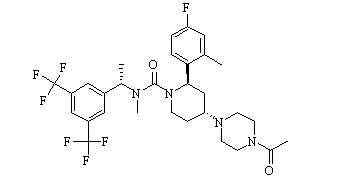 Casopitant is a centrally-acting neurokinin 1 (NK1) receptor antagonist with antidepressant and antiemetic activities. Maropitant Citrate is a neurokinin receptor antagonist with antiemetic activity.